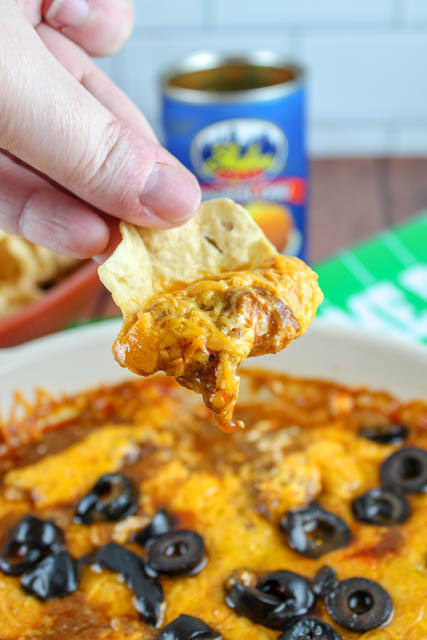 Recipe: Skyline Chili Dip | The Food Hussy! Skyline Chili is pretty much liquid gold in this city - and I have to say when I moved here - I didn't get it - but now - I do!! Cincinnati chili is so crazy good - but it's not like any other kind of chili - it's a thinner chili with hints of cinnamon, all spice and chili powder. 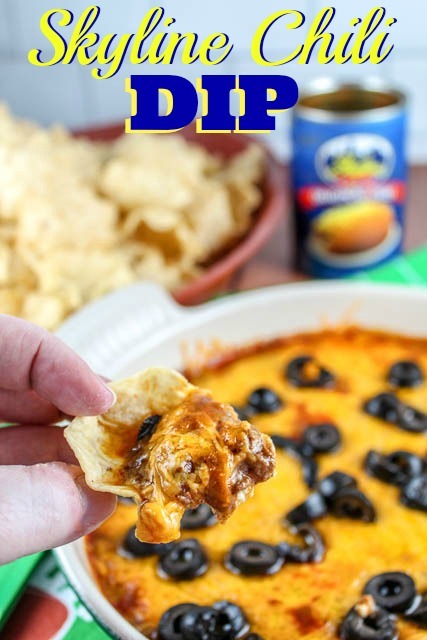 The traditional ways to eat Skyline Chili are: on spaghetti, on a coney dog or in this amazing dip recipe! And with the Super Bowl coming up next weekend - you need to make sure you have something new on that game day spread! This is it!!! It's such an easy recipe - and goes together in just five minutes - even quicker if you buy pre-shredded cheese. I never do - I love the fluffiness that comes from freshly shredded cheese. You need to use sharp cheddar cheese with this - and it's perfect for those Scoops chips!! Cincinnati chili spaghetti is called a three-way and consists of spaghetti, chili and cheese - but you can make it a four-way or five-way by adding kidney beans or diced onions. So for this dip - I added sliced olives because I love them!!! But feel free to be a real Cincinnatian and make it a four- or five-way by adding kidney beans and/or diced onions. 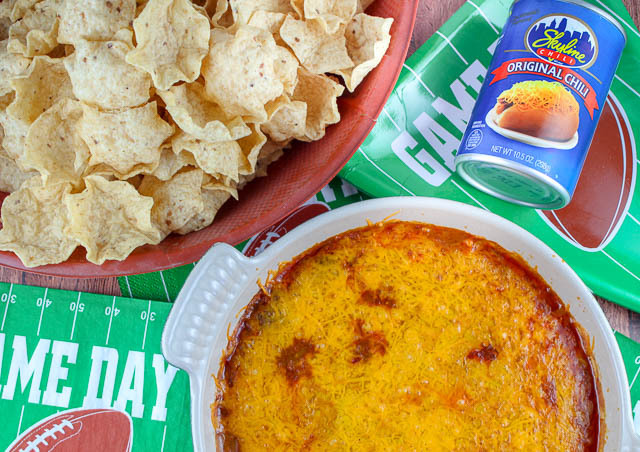 Skyline Chili Dip can now be a game day staple in your house too - don't leave this treasure just to the city of Cincinnati!! You need it for your party! It's so delicious! You'll thank me! 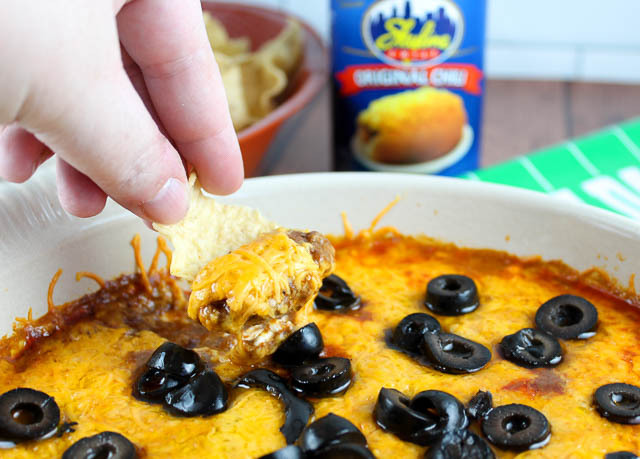 Skyline Chili Dip is a staple in Cincinnati - it's at every game day party - but why should we keep this secret to ourselves?! Cincinnati Chili is a greek chili that is very unique with hints of cinnamon, chili powder and so much more. Pair that with cream cheese and loads of shredded cheddar - you're going to love it! - Use this amazing recipe from my friend Amanda and make it from scratch! Perfect for the Super Bowl this weekend!